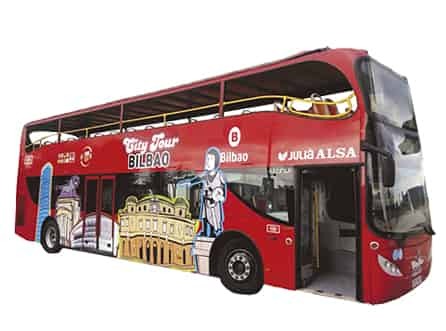 Bilbao City Tour has a fleet of two red double-decker buses with an open-air top deck for an unparalleled panoramic view of the city. The buses feature comfortable ergonomic seats and have a space reserved for wheelchairs. Also, for easier access by people with reduced mobility, all our buses have an access ramp at the rear door and a completely flat lower deck. To make it easier for passengers to get on and off, please board using the front door and leave via the rear door. Our vehicles also have two stairs connecting the lower and upper decks. Please use the front stairs to go up and the rear stairs to go down. This will help passengers go upstairs and downstairs more easily and enjoy the route more. You can learn about the history of the city through a comfortable audio system with headphones, available in 8 languages. Space designed for people with reduced mobility. We provide you with a guide which includes a map inside that shows all the stops on the itinerary. Our bus route will take you to the city’s most important sights: interesting squares, unique museums, its estuary and bridges, theatres and the old town. The route lasts approximately one hour. Thanks in advance for choosing Bilbao City Tour. With us, you’ll find a different and more convenient way to enjoy Bilbao. 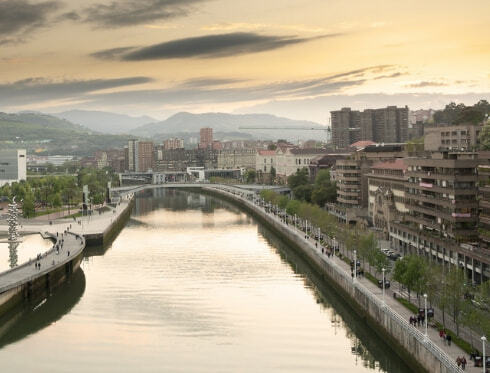 Explore Bilbao with the tour bus. 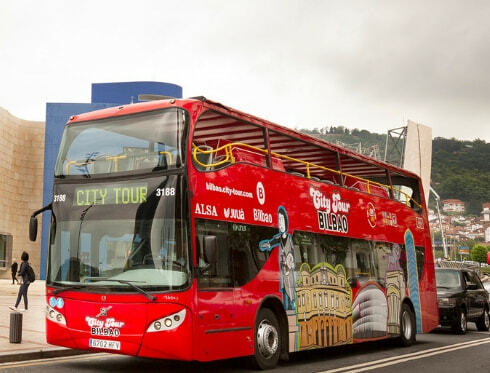 Discover the city with the Bilbao City Tour and enjoy our Hop-on Hop-off service, which lets you get on and off as often as you want at any stop along the route. Take advantage of this service to discover the places of interest on the route. The tour bus route is designed to let you experience every last detail of this magnificent city. The Bilbao City Tour will take you to the most important sightseeing spots, from the stadium of Athletic de Bilbao, San Mamés, to the Ribera Market, a reference in terms of shopping for the whole of Biscay. The service features an audio system in eight languages: Basque, Spanish, Galician, Catalan, English, German, French and Italian. You can select your language and listen to the audio during the route to learn about the city’s fascinating history. From 23 June to 9 September, from 12 to 14 October, from 1 to 4 November and from 6 to 9 December. Runs every 30 minutes. Our service departs from the Guggenheim Museum at 10:30, 11:00, 11:30, 12:00, 12:30, 13:00, 13:30, 14:00, 14:30, 15:00, 15:30, 16:00, 16:30, 17:00, 17:30, 18:00, 18:30. Rest of the year. Runs every 60 minutes. Our service departs from the Guggenheim Museum at 10:30, 11:30, 12:30, 13:30, 14:30, 15:30, 16:30, 17:30. 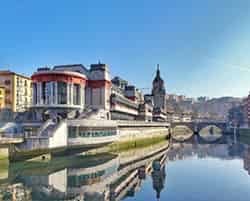 When you board one of our buses, our staff will give you an informative brochure with a map of Bilbao and detailed information about the stops along the way.